(Bloomberg) -- Not yet six months into his job as chief executive officer of Deutsche Bank AG’s asset manager, Asoka Woehrmann visited offices across the globe and rehired a former star manager to boost morale. Last week, he took more painful measures, firing dozens and more cuts are likely, people familiar with the matter said. That question has only gained urgency since Deutsche Bank entered into talks to acquire Commerzbank AG, a deal that may require Germany’s largest bank to raise billions. Firms including Allianz SE, UBS Group AG and Amundi SA are all potentially interested in partnering with DWS in some form, according to people familiar with the matter. While the lender is reluctant to put DWS on the block, it may have no choice if shareholders don’t cough up enough fresh cash. 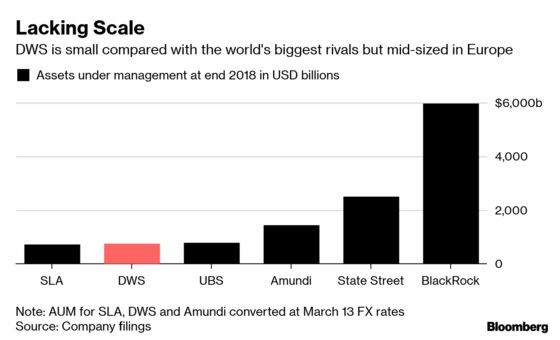 “Everything is possible” if Deutsche Bank were to look for ways to raise cash to fund the tie-up with Commerzbank, Bank of America analysts led by Andrew Stimpson wrote in a recent note. But selling DWS “would make the new entity less attractive and less likely to eventually improve profitability” to acceptable levels, they wrote. DWS shares fell almost 30 percent last year, exacerbating a sense of frustration at the company after the initial public offering in March. This year, they have rebounded about 37 percent, not least on speculation about a potential deal with another asset manager, and now trade close to the IPO price again. 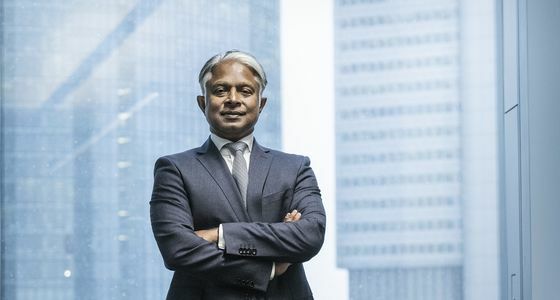 With Deutsche Bank knee-deep in deal talks, Woehrmann has been focusing on a strategic review of the business, the results of which may be announced within the second quarter. It’s likely to result in further cost reductions, possible cutbacks to the company’s product offerings, and changes to its U.S. operations, according to people briefed on the matter. Woehrmann may also discard some of the ambitious targets set by his luckless predecessor Nicolas Moreau. The new CEO has ample experience restructuring. Between 2015 and 2018, he was head of German retail clients at Deutsche Bank’s retail and commercial bank, his only career stint outside DWS. The unit’s head at the time, Christian Sewing, asked him to implement an ambitious cost-reduction program that included closing almost 200 retail branches and eliminating thousands of jobs. Yet the challenge he’s facing won’t be addressed with people skills and cost reductions alone. 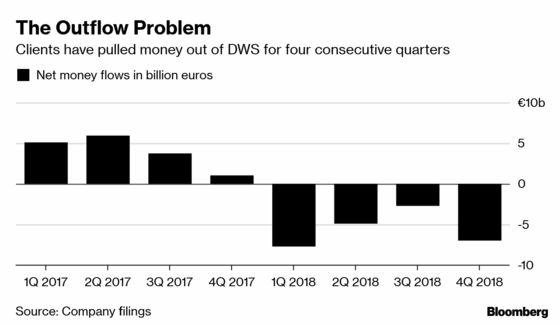 DWS suffered 22.3 billion euros ($26 billion) in outflows last year. Changing that won’t be easy amid a tough market outlook, competition from larger, lower-cost firms, and a parent company whose struggles have put off potential clients.